The East End Eye is the voice of Glasgow Games Monitor 2014, a group of residents, activists and campaigners who are concerned about the effects of the regeneration in the East End of Glasgow. As the Centre of Housing Rights and Evictions (COHRE) have shown, when a big new development is attached to a major sporting event, such as an Olympics or Commonwealth Games, people are often forced to move from their homes and relocate their businesses. The Olympic Games alone has displaced over two million people from host cities around the world through demolitions, higher rents and gentrification (the displacement of poorer residents to make way for wealthier, higher tax-paying residents). Whether the Games will bring benefits to an area over the long term is hotly disputed, but the inevitable reality is that individuals, sometimes whole communities, will be displaced to make way for new facilities. The residents of Dalmarnock (an area which has suffered from decades of under-investment) are currently bearing the brunt of this process of displacement to allow Glasgow to host the 2014 Commonwealth Games. Recently, a Compulsory Purchase Order (CPO) was served by Glasgow City Council on remaining properties not already in Council ownership which are earmarked for demolition to make way for the building of the Athlete’s Village. This includes properties in Ardenlea Street and a number of shops in Springfield Road. Before a CPO is served, the Council are required to `negotiate’ with property owners and come to a just and reasonable compensation for their property. In the case of Mrs Margaret Jaconelli and her family, who are long-time residents of Ardenlea Street, this has not been the case. As she watches the land across the road from her being sold for millions of pounds per hectare, Mrs Jaconelli is still waiting for a reasonable offer for her property from the Council, and for a proper negotiation to take place. She and her family have been the only occupiers of the last remaining tenement building in Ardenlea Street for the past six years. The winters are cold and damp with empty flats and dereliction all around. The family are unable to take a holiday for fear of leaving their home vacant. Mrs Jaconelli and her family remain, not because they want to, but because the Council has failed to provide proper compensation. They would much prefer to have been settled in a new home, and for all the uncertainty to be over. Many of the businesses around the corner in Springfield Road are facing the same problem, with long delays in compensation forthcoming and the prospect of a legal battle ahead to achieve some kind of justice. The Council have not replied to the various letters of objection to the CPO for the Athlete’s Village site and it is difficult to say when Mrs Jaconelli and others affected by the CPO will be able to get on with their lives. Meanwhile, they have to live in a derelict area which is deteriorating day by day. The Council should play fair, and give these residents what’s due to them. What is The East End Eye? 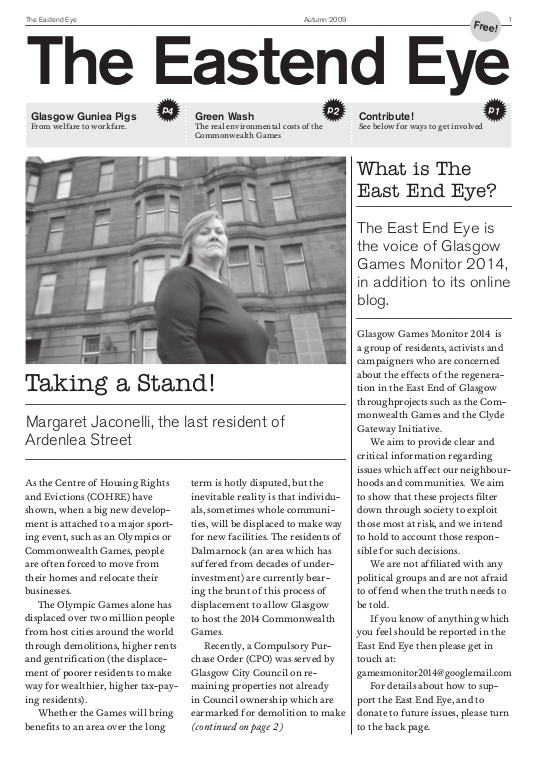 The East End Eye is the voice of Glasgow Games Monitor 2014,in addition to its online blog. We aim to provide clear and critical information regarding issues which affect our neighbourhoods and communities. We aim to show that these projects filter down through society to exploit those most at risk, and we intend to hold to account those responsible for such decisions. For details about how to support the East End Eye, and to donate to future issues, please turn to the back page. Green Games or Green Wash? The bid for the Commonwealth Games 2014 has committed the Council to a Green Games - the City council has to be seen to be green. The Commonwealth Games organizers have made much of their environmental credentials leading up to 2014, but do they really come up to scratch? promises looks more like ‘green-wash’ than ‘green games’ to us. five-mile M74 northern extension – a key ‘legacy’ component of both CG 2014 and the Clyde Gateway Initiative. The M74 motorway, “Britain’s most expensive road”, will cause environmental and economic havoc. Coming in at a whopping £700 million pounds, this “concrete monster on stilts”, works out at over £80,000 a metre! All this disruption, pollution and expense will come despite the recommendation of the Scottish Government’s own independent enquiry that the road should not be built: “...this proposal should not be authorised, and...the various orders should not be confirmed”. Never mind! In an amazing ‘democratic deficit’, the Scottish Executive went ahead with road anyway! The £80 million East End ‘degeneration’ route will only add to the problems of severance and pollution, despite vocal support against it. Forget all the ‘green-spin’, the overall context for sustainability in the East End has already been laid down in Glasgow’s notoriously outdated, environmentally noxious roads policy. It will take more than a few cycle lanes and low-carbon vehicles to make Glasgow a ‘dear green place’ again. We need a revolution in transport policy. Commonwealth Utopia - are you in the picture? Of 1,400 houses, 1,100 will be for private sale, 300 will be for rent. What percentage will be affordable for low income families? Duty bound to justify the enormous expense and disruption in the East End for less than two weeks of TV spectacle, the Commonwealth Games promoters are keen to stress the importance of a Games ‘Legacy’. Much has been made of the fact that the Commonwealth Games Village, constructed as a ‘global showcase’ for athletes quarters, will later be ‘retro-fitted’ into a new riverside housing neighbourhood said to benefit the local population. Yet the hype requires a reality check. Of the 1400 houses, 1100 will be for private sale and only 300 (or 21%) will be for rented housing. More worrying still is that despite earlier reports that these 300 houses would be socially rented, this has now been dropped and it appears they will be for private rent. Meanwhile, the City Council have chummily offered to subsidise the Village site for developers by making the land available at nil cost. This reduces the developers’ initial borrowing requirements, and increases their potential for profit - at our expense and our risk. The Council has made it clear that in the current economic climate it will be ‘open for business’; ever ready with ‘flexible’ arrangements to bail out large companies and multinationals as they ‘struggle’ to make a profit – bailed out just like the banks by the UK government. This is the now familiar formula of ‘public pain, private gain’. While Glasgow City Council subsidises developers and homes for the wealthy in one of the most disadvantaged areas in Britain, it is deeply unlikely that the 50% of the local East End population who live in socially rented housing will be able to afford to buy or rent a home at the Village. Competition will be severe. What’s more likely is that the ‘showcase’ homes will be targeted at some of the 20,000 people the Clyde Gateway Initiative hopes to attract to the area over the next 25 years with the help of Commonwealth Games hype. Gentrification is the name of the game. Good public housing has never been gifted to the people of Glasgow – it has always been fought for. The time is now to build up existing and new tenants and residents networks who can fight for a quality housing deal. Glasgow’s Guinea Pigs: Welfare to Workfare? In February 2008, City Leader, Stephen Purcell, promised to focus on tackling health and unemployment in Glasgow. But recent reports show that Glasgow has the highest real unemployment level in the UK with at least 60% unemployment in many areas of the East End. This might seem like evidence for why the new Welfare Reform Bill is needed to push people back into employment. Yet this attitude of pushing -- but not helping -- people into work has led many anti-poverty campaigners to highlight the detrimental affects the new Bill will have on both the unemployed and on workers in Glasgow. Steven Purcell is towing the Party line that people no longer have the right to work but have a duty to work, even if it's for a humiliating £1.50 an hour under the new US-style workfare scheme. With Glasgow's notorious unemployment levels this begs the question: What has Purcell been doing for the last two years? Meanwhile, from 2011, Glasgow will be a guinea pig for the government's new workfare scheme. The organisations that ‘match’ workers to jobs will be ‘incentivised’ by cash rewards, meaning that profits, as ever, will come before people regardless of whether the job is suitable or not. The new Welfare Reforms will primarily benefit the organisations and private businesses who are subsidised by cash handouts ("incentives") from the state - not the unemployed. The proposals do not look at the suitability of the current benefits, nor do they take positive steps towards helping parents and carers back to work, such as providing child care options. Recent Labour Reform has also been independently shown to overestimate the 'supply side' (more workers, less good quality jobs) to redress the jobs shortage. Studies also show that taking on insecure, low paid work is more damaging than worklessness itself! Wage levels are simply not high enough to ensure a "living wage". SO the Bill actively promotes a situation where disadvantaged groups are bounced between working-poverty and workless-poverty. Workers should also remember that an attack on welfare benefits is an attack on low-paid workers too, as it increases competition in the labour market and helps to suppress wages. This Bill will not lift people out of poverty but will instead drive them towards more hardships and increasingly desperate measures, while private companies make huge profits at our expense. After the Games, the Village area will become a vibrant neighbourhood, a flagship for the regeneration of Glasgow’s East End and a visible reminder of the legacy of the Games. Hey, thanks for putting these up.. Would you be able to add a parent page and then add all of these as child pages? That would basically make all the issues like chapters of the parent page (and so easier to find all the issues as they'd all be together).. if you're not sure how, then just ask and I'll walk you through it..
to add more issues, just go to this parent page and click "add child page"
one other thing, please don't add so many tags to the issues. For example, unless you do an entire issue about the welfare state, don't add the sector "welfare". So most of these I have just left the group tag "Glasgow games 2014"
but cheers again, keep them coming!